Lang Son is a northern mountainous province of Vietnam, with two international border gates to China, Dong Dang and Huu Nghi, in Lang Son. There are seven ethnic groups in the provinces, including Nung, Tay, Kinh, Dao, Hoa, San Chay, and H’mong. Lang Son has a lot of potential in agriculture development, natural resources, trading, and tourism. The province takes pride in its many natural and historical sites reflecting the diverse nature of its culture as Bac Son and Mai Pha cultural sites. It also has famous sights mentioned in Vietnamese literature and music such as Dong Dang, Ky Lua, To Thi, and Tam Thanh. 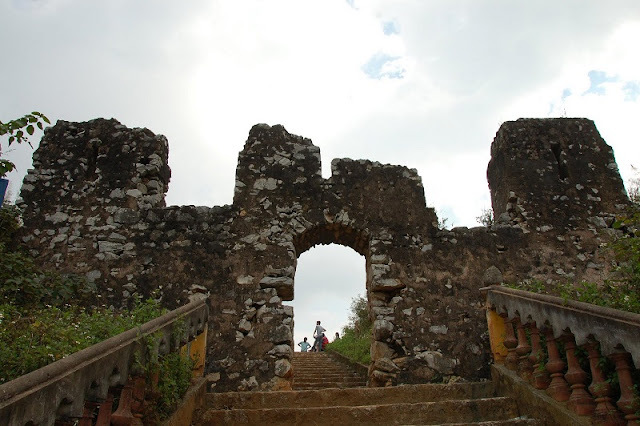 The Fortress of the Mac Dynasty is located in Tam Thanh district. This used to be one of the most important military constructions in the feudal period of Vietnam history. Nowadays, it is ranked as a national site and is being renovated to welcome tourists from all over the country. The most prominent part of this site is two long stone walls running between the cliffs of mountains. According to research of historians, the walls that we see are the vestiges of a vital military center standing between the northern and southern parts of the country. 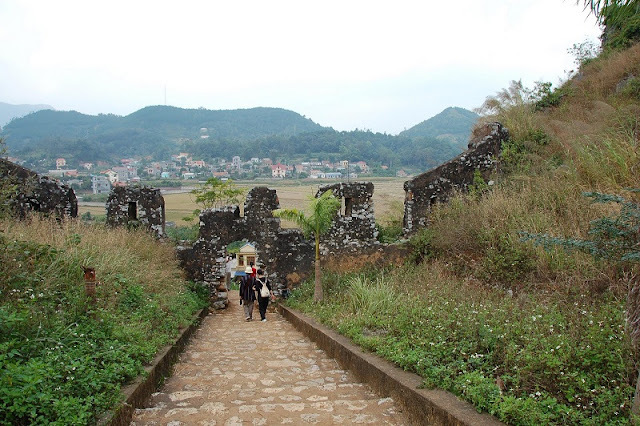 It was erected by Mac Kinh Cung in the beginning of the 16th century to handle the Le-Trinh dynasty which was always in an opposing against the Mac Dynasty. Even though the scope of the fortress is not so great, it is still evidence of a tumultuous time in the history of the country during which the “brothers in a family” fought each other. Standing on the peak of the fortress which lies between two spectacular cliffs, you can spread your view all over a natural, untouched yet mysterious area. You can also notice from the high walls many dangerous spike traps surrounding the fortress. All of these elements of the fortress enabled the Mac Dynasty to rule and keep the border safe for nearly a century. Ky Cung is a small temple with tiled roof, which worships the God of Ky Cung River. At the front of temple is a stone wharf (Ky Cung stone way), which was considered one of the eight Lang Son’s places of interest in the 18th century by Ngo Thi Si. The architecture of the temple is in the shape of the letter dinh (shape). This is a newly restored building. The temple has no private greeting gate, so a greeting gate is at the main apartment, which includes three vault-shaped doors with two brick square pillars that have carved edges and patterns on the surface. There is a set of three holy objects: a tripod and two flowers pots. There are two multi-layer towers outside to hang bells and drums. Today, the temple remains a sacred place and also a tourist attraction. To Thi Mountain or Vong Phu Mountain means "waiting for her husband". From ancient times, this human-shaped stone has been associated with the fairy Mrs To Thi holding a baby to wait for husband to return from the battlefield, but never saw him return. She finally turned into a rock. So people called it To Thi. Located on northwestern Tam Thanh Mount, Lang Son City, the legend about To Thi persists in the minds of the Vietnamese. Throughout the years, from natural and human impact, the rock has become heavily damaged. However, Lang Son province has created a copy of To Thi to retain this cherished relic. At Mau Son, the wind whistles up and the clouds float down. Standing at the highest peak of Mau Son Mountain, tourists will have a panoramic view of Lang Son region which looks like a Chinese ink drawing. In addition, you will have a chance to join the local daily life and culture of ethnic minorities. 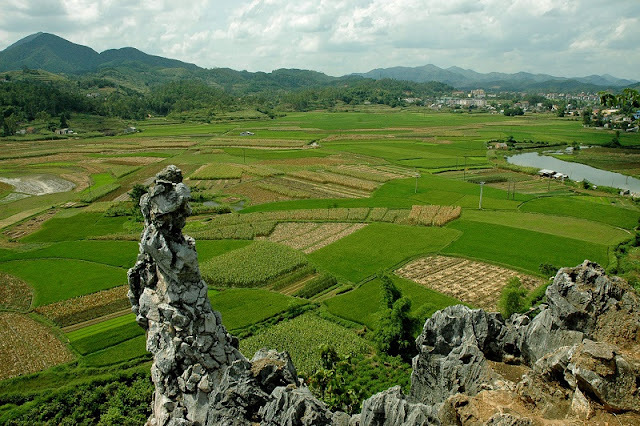 Mau Son Mountain is located in Loc Binh District, about 30km from Lang Son City. To the north is Ninh Minh, China, to the east is Na Duong and to the west is Dong Dang, all merging beautifully into one spectacular landscape. The winding narrow mountain path, like a snake, is tucked between 2 steep mountains. About seventy years ago before this path existed, there were only two ways to the top, walking or on horseback. At that time, this panoramic area attracted the French to Mau Son for relaxation. The weather was cool all year round and in addition, the Mountain View of the northeast was the gateway to China, and the French built a military base there at the early of the 20th century to guard the border. The site's original inhabitants, members of the Dao ethnic minority, were moved to make way for the French settlement. Only authorized personnel were permitted to enter the French base. Later, tourists coming to Mau Son were also welcome to the hill station. In January 1936, Dr. O.Pflot, a student of the famous bacteriologist Dr. Alexandre Yersin, visited Mau Son. Some local people say that the doctor first came to Mau Son to collect traditional medicinal herbs, which were cultivated in the region. And then, he petitioned Mr Tholace, then French governor of the North, for permission to build tourist villas at the site. In 1936 he bought land and started construction. There were thousands of local people working on the project, all mining, breaking and carrying stones to a number of massive villas; all in all it took seven years of work to accomplish this task. There were no bricks available to build with; the only materials available were stones, led to ruins. Blocks of orange moss-covered stories are scattered throughout the site, lying dead amongst the old foundations, where even now, it is possible to identify the houses, former kitchens, fireplaces and staircases. Like sleeping beauty, after almost five decades, it is all but forgotten. Until 1987 motorbikes were not even allowed onto the tortuous road up the mountain. Mau Son will be developed to become a tourist area with mountain climbing, sightseeing, and recreational activities in the future. Ky Lua Market is situated in the city center of Lang Son. The market has been into operation for hundreds of years. It has become a bustling trade center for local people as well as visitors in Vietnam. 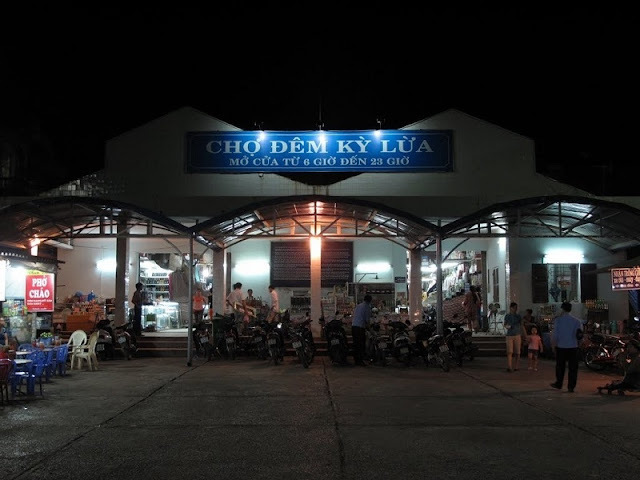 Ky Lua Market is where occurs the exchange of goods between regions in the country with cultural activities being characterized the national identity of Lang Son province. The market monthly occurs 6 sessions dating on 2nd, 7th of lunar calendar, and it consists of goods from almost all provinces. People usually not only go to market for sale but also to visit, talk about business. Ky Lua Market is also a meeting place of young ethnic people such as Tay, Nung, Dao. They gather in the market, buy the goods, meet their friends and find their partners through love songs. At the market, along with diverse color of brocade, clothes, there are delicious dishes characterized by Lang mountainous area. Each year, Lang Son occur Ky Lua fair, lasting from 22 to 27 January lunar months, this is the traditional cultural activity. Ky Lua market today has been transformed and open all day and night. With the fresh air of the frontier mountain region, tourists in Vietnam travel can’t help moving and being impressed with the shopping activity in night scenes when once traveling to Lang Son. 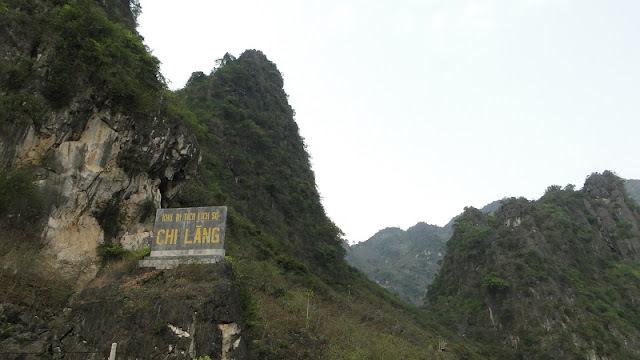 Chi Lang Border, also called Ải Chi Lăng in Vietnamese, lying in the south of Lang Son province, used to be a strategic spot of war, and is now a historical vestige. It has become an interesting destination for tourists who are fond of joining Vietnamese history-discovery tours. The Chi Lang Border is located in Chi Lang District, and 110km from Hanoi and 60km from the Sino-Vietnamese border. It consists of a valley surrounded by high mountains and through which runs the Thuong River. The mountains opened in two locations to form two gates. The northern gate was named Quy Mon Quan, meaning "monster gate," after the Chinese invaders who entered Vietnam through this gate. The southern gate was called Ngo The, meaning "swearing gate." Vietnamese ancestors who swore to sacrifice their lives to protect their motherland and to prevent invaders from entering Vietnam built the gates. In the past, in this area King Le Hoan defeated the Chinese Sung troops in 981 and killed all enemies. In 1076, Prince Consort Than Canh Phuc set a front line against 300,000 Sung enemies. Led by Quach Quy in 1285, Nguyen Dia Lo killed traitor Tran Kien in the second National Resistance against Yuan-Mongol invaders. In 1427, Lam Son righteous army killed invader leader Lieu Thang, caught Hoang Phuc, killed 10,000 Ming enemies and overthrew all their maneuvers. 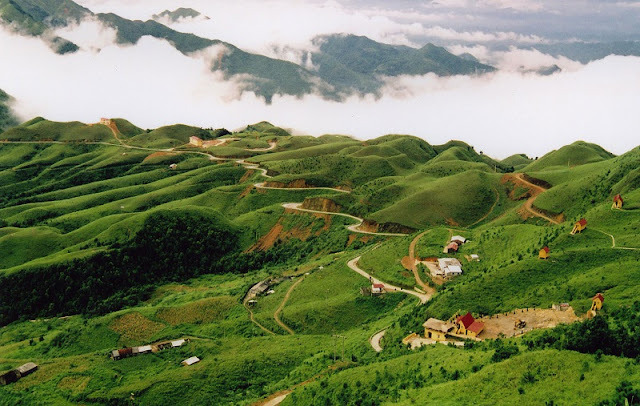 Nowadays, joining tours in Vietnam, tourists see the Chi Lang Border as a stop in a journey to Lang Son where they can enjoy the imposing natural beauty of the landscape. Nhi Thanh Grotto is situated in Nhi Thanh Street, approximately 1 km from Lang Son City. A natural cavea bout 600 m deep, it is an attractive destination. It is home to the Pagoda of Triple Regions (Buddhism, Taoism, and Confucianism). The grotto was closely related to the celebrity Ngo Thi Si when he was the chief of province between 1777 and 1780. He gave, in a short span of time, a new look to Lang Son in term of politics, economy and national defense. Especially in the domain of culture, he had the merit to discover eight beautiful landscapes of Lang country including Nhi Thanh Grotto. He hired workers to start the renovation of this grotto in 1779. The right side area, being on a relatively more elevated land and the configuration of terrain better, was chosen to be the place for the building of the Pagoda of Triple Regions (in honor of Confucianism, Taoism, Buddhism). 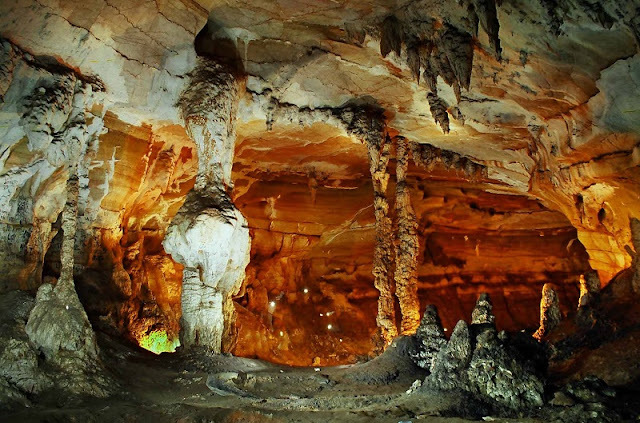 Being a natural cave, Nhi Thanh Grotto lies beneath the Pagoda of Triple Regions, with a depth of 600 meters. On the cliffs at the entrance are 20 inscriptions that are precious historical and literary documents, including autographs of famous scholars. The statue of scholar Ngo Thi Sy on the cliff engraved in 1779 is a precious work of art. The length of a corridor from front entrance to back entrance is over 500 meters with many beautiful and picturesque landscapes. Inscriptions can be seen today on te grotto, which were engraved by famous personalities and poets over different epochs. The poem was written by Ngo Thi Si (1726- 1780) when he was stationed in Lang Son as the commander of the Lang Son military post. Ngo Thi Si praised the beauty of the magnificent mountain and landscapes possessed by Lang Son. Ngo Thi Si was the person who discovered Nhi Thanh Grotto. The name Nhi Thanh was chosen by Ngo Thi Si to commemorate his birth place in Ta Thanh Oai village in Thanh Oai district, Hanoi. To commemorate his great contributions to the grotto, Ngo Thi Si had his portrait carved on an interior wall. "Flows of clean pure white streaming water run over hundreds of pieces of marble as if it is talking. Turn one's back to the stream and look up to a high mountain peak in the form you can see the Vong Phu peak". 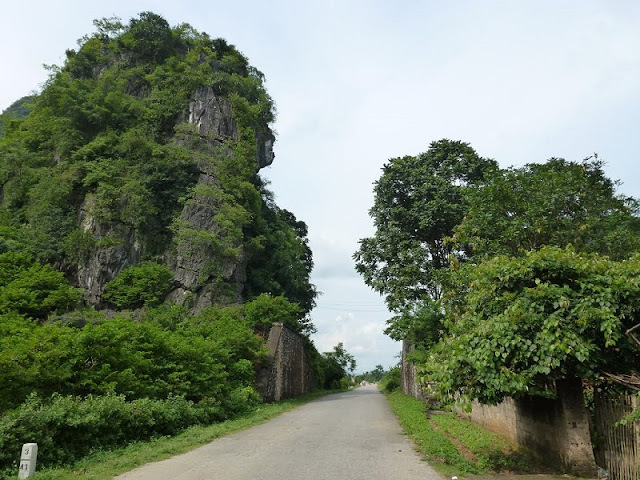 Ngo Thi Si’s verses will inspire you to visit Lang Son’s beauty spots, and Nhi Thanh Grotto is one of the eight sites that attract a large number of visitors to Lang Son. Bac Son is a district in Lang Son. It's 160km from Hanoi to the north. 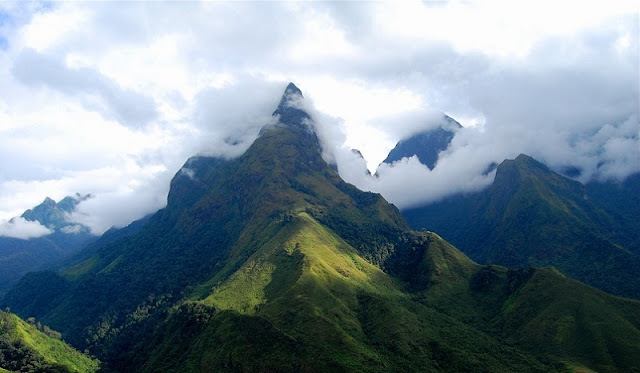 One of the interesting aspects about Bac Son valley is its high mountains of 500-1200 meters. 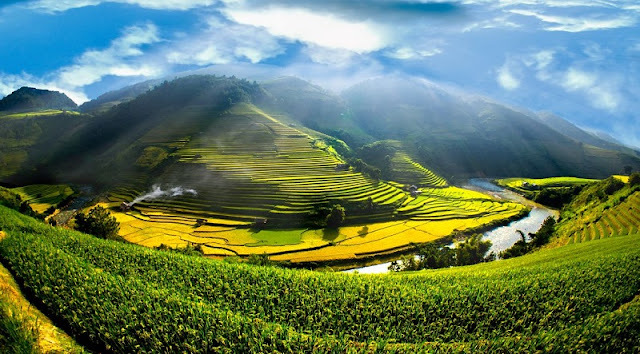 These mountains, together with the valley’s paddy fields, create a great scenic landscape that you can only see best after climbing to the peak of a mountain. Bac Son valley pathway leads you to the paddy fields where you’ll get a chance to see the beautiful river that crosses the rice fields. Besides the valley itself, Bac Son district’s villages possess a beauty of their own. The district is inhabited by the Tay ethnic people and their traditional stilt houses. Overnight tours are the best for both beautiful scenery and learning about the local life of the hill tribe. If you wish to see the entire view of the valley, you need to hike up to the telephone station which was built on the top of a high mountain. From here, you can see the stunning 360-degree scenery of mountains, villages, rivers and farms. It can be tiring to climb the mountains, but the effort is worth it. The early settlers of the Bac Son Valley initially resided in Lang Son province. When Lang Son was explored in 1922, 43 sites were found related to the ancient Bac Son culture in the mountains. Bac Son flat terrain is favorable for irrigation, so rice is planted in two seasons and it is often harvested later than most other areas from half a month to a month. 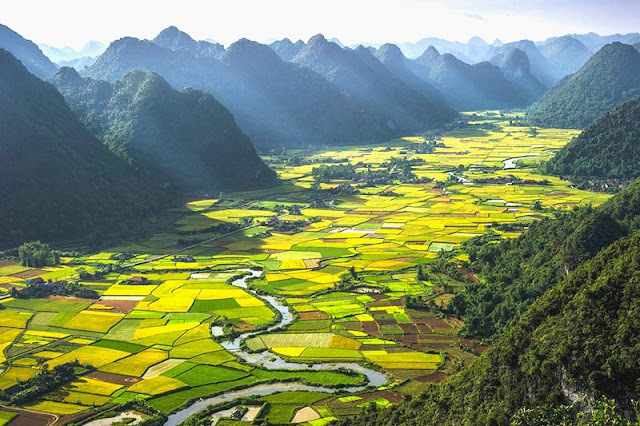 Rice is not grown in Bac Son at the same time so fields are harvested sooner, and some later, creating a colorful sight. Make sure that you visit this enchanting valley of beauty. Seeing such a beautiful place will make you realize that Mother Nature has so much to offer. Moreover, there is so much to explore in the valley and its surroundings. Some of the interesting activities include climbing to the summit of telephone-station Mountain for the panoramic view; walking or bicycling around to visit the villages of stilt houses to see locals working on their rice and vegetable fields. Hiking on a back road to enjoy the peaceful land. Don't hesitate; get your bag and go! If you just go on the road across the town between the valleys, you will not know how beautiful the surroundings are. Only when standing on a high mountain and watching the panoramic valley, you truly overwhelmed by the colorful beauty of this place. 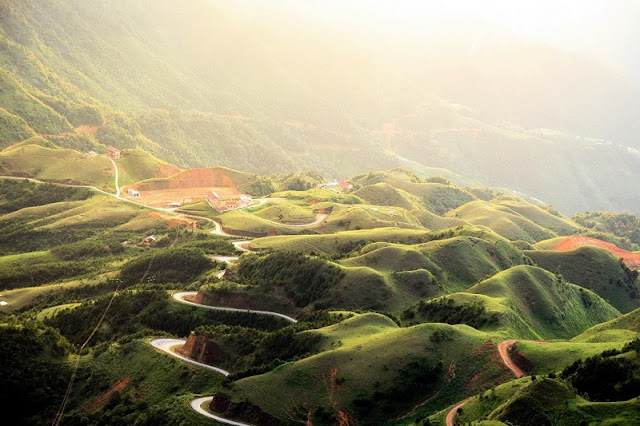 To go up the mountain where you can enjoy panoramic Bac Son, you have to take a lot of effort, but when you look down, all the tiredness disappears. You will feel peaceful and relaxed looking at the beauty of the fertile Bac Son valley in the early sunlight. Tam Thanh Pagoda in a stone cave (also known as Tam Thanh Grotto) located in Tam Thanh Ward, Lang Son City, Lang Son District. 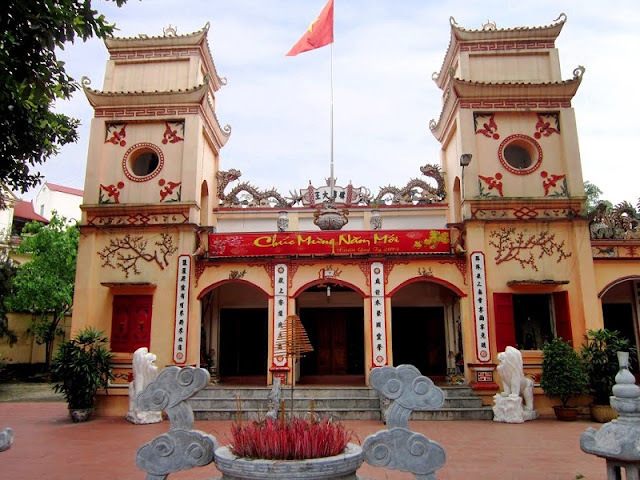 According to a history book called Dai Nam Nhat Thong Chi, Tam Thanh Pagoda was built during the Le Dynasty, located in Vinh Trai Commune, Thoat Lang District. Tam Thanh Pagoda retains its inherent natural beauty, attracting visitors from near and far. In Tam Thanh Grotto, there is a white big Buddha Amitabha statue in the flexible soft art style of Le - Mac Dynasty. The statue is in a standing position in the shape of a Bodhi leaf. It has the height of 2.02m and the width of 0.65m well-carved into the cliffs. The statue is covered with a Buddhist priest’s dress from shoulders to heels. Below the statue are Tam Bao Palace and Am Ti (Hell) Lake which is blue all year round with stalactites constructed by nature with majestic and vivid shapes. 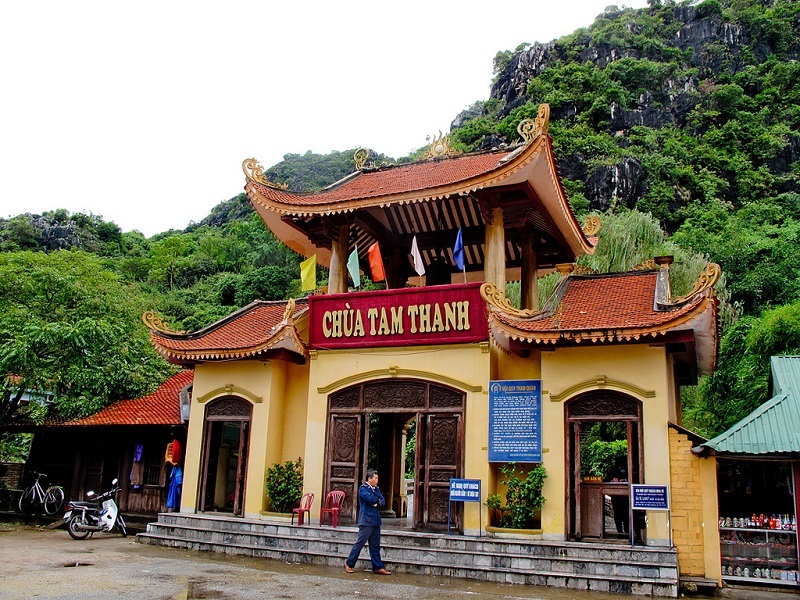 Tam Thanh Grotto has a length of 50 meters and Thong Tien (Theosophy) Gate leads to the top of the mountain. Tam Thanh Steele says: "The grotto is created by heaven and earth. It is the sacred landscape of talents and difficult to describe and paint." Researchers said that previously Tam Thanh Pagoda was a place of worship of Taoism. Tam Thanh meant Ngoc Thanh, Thuong Thanh and Thai Thanh which were the three highest palaces and the three fairy scenes in which each scene was governed by a deity. The marks of religion only remain in its name; Tam Thanh Pagoda has become a relic of religious beliefs. In addition to its scenic values, Tam Thanh Pagoda is also known for cultural values. Currently in the temple has a statue system as well as plentiful epitaphs of writers and poets over historical periods. In particular, the stele number 4 (Ma Nhai) is the oldest carved in the second year of Le Vinh Tri Dynasty (1677) recording the details of the construction and the renovation of the temple. The stele mentions a poem of Ngo Thi Si who was the director of Lang Son town in 1777. 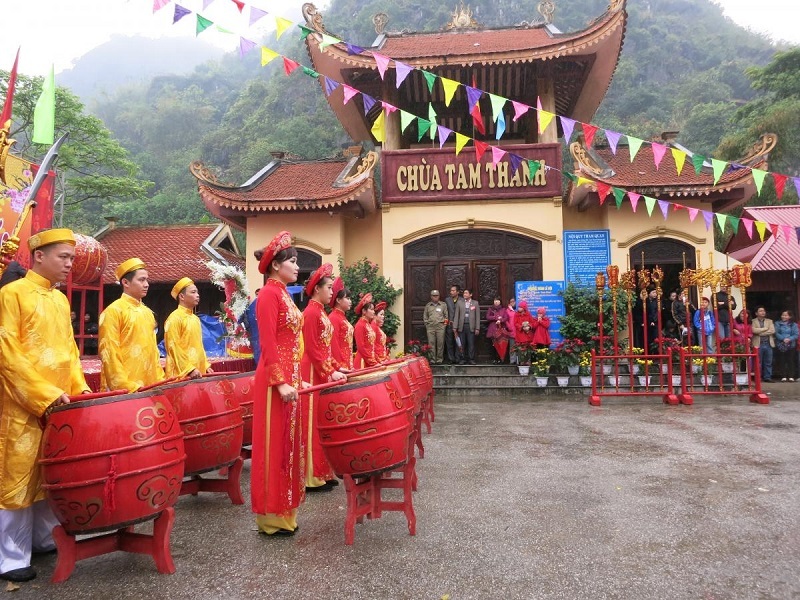 The poem praises the beauty of the charming Tam Thanh Grotto. Tam Thanh is a complex including three caves ( Nhat Thanh, Nhi Thanh, and Thanh Tam) in Tam Thanh Pagoda. Tam Thanh Grotto is located on a mountain in the shape of elephants prostrating on the green grass. Tam Thanh Grotto lies halfway up the mountain and can be reached by 30 stone steps carved into the mountainside. The right side of the grotto is a poem composed by Ngo Thi Si (1726 -1780) when he was the director of Lang Son.